Other gum machines had little square colored gum pellets (I guess you'd call them). You got 4 or 5 of them at a turn. Can't say I ever saw that, Alan, but I'd imagine that there'd be a whole lot of shaking goin' on in an attempt to position the speckled gumball advantageously. 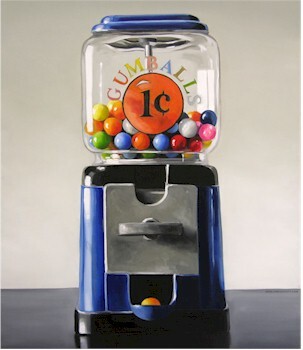 Does anyone else remember when some gumball machines had one speckled gumball, and if you got that one, you would be given a free candy bar? Those were the days! Yup...put in a penny and turn the knob and hear the gumball fall ! Some of these gumball machines has old gum.....and ofter we could see insects inside of the glass compartment......we avoided those !! !